Self Edge was founded by Demitra Georgopoulos (top) and Kiya Babzani. Complex: What really separates the $75 tier of denim from the $200 tier? Kiya Babzani: I&apos;d like to think that you&apos;re paying for better quality, but unfortunately with 99% of brands available you&apos;re paying for the designer&apos;s name. Often the consumer doesn&apos;t fully see the difference until after a few months of daily wear when the denim has aged naturally. Complex: What do you see as the next big trend in denim washes? Kiya Babzani: We hope that raw denim continues as it is denim in its original true form. Just like you wouldn&apos;t purchase a T-shirt with rips and holes or a watch with a cracked bezel, we see no point in buying a pair of jeans that looks like it&apos;s already been worn for two years. Complex: Give us three brands you recommend that won&apos;t kill our budgets. Kiya Babzani: Real Japan Blues, Iron Heart, and Flat Head are doing amazing things. These brands put so much work into the denim itself that the way their jeans look after a few months of wear is so dope you&apos;d have to see in person to believe. Complex: Some denim nerds say that the only to way to wash your jeans is in the ocean. What is really the best to wash your denim without messing it up? And is the "never wash your jeans" thing good advice, or all hype? Kiya Babzani: We recommend washing jeans inside-out in cold water while using a gentle detergent. As opposed to using a dryer, line-drying works best. Ocean washes are great, but can leave a terrible smell that can only be removed by doing a hot wash. The "never wash your jeans" or "don't wash for six months" is all hype and another way to make something extremely accessible seem more exotic to those just starting to learn about denim. At the end of the day they're still jeans and probably the most resilient article of clothing most people will ever own. Complex: What&apos;s denim weight indicate and is that something that you should really care about? Kiya Babzani: Denim weight is measured by square yard of loomstate denim; 14.5oz denim weighs 14.5oz per square cut yard of denim in its raw state. Denim weight is important in that it effects the way the denim will fade and age over time, but it&apos;s just one of the many factors that goes into what makes up a certain denim. Twill-weave pattern, post-weave processes, indigo type, indigo dipping style, and the weave-cross pressure combined all determine what the denim will end up feeling and looking like after repeated wears. 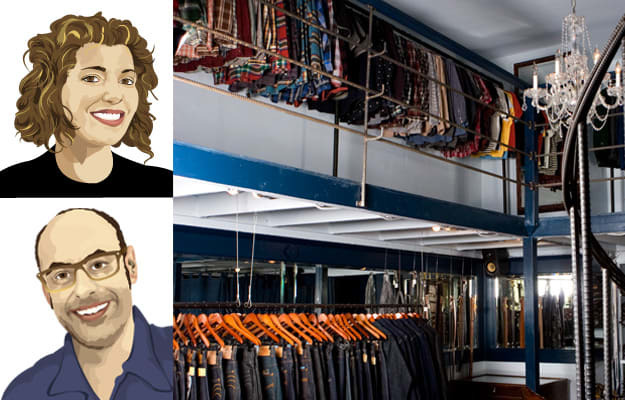 Complex: Is taking denim to the tailors something only a soccer dad should do? Kiya Babzani: We recommend only hemming jeans. We think there are so many different styles of jeans available from most manufacturers that there should be no reason to spend $300 on jeans that you&apos;d have to take to the tailor to have modified beyond a simple inseam shortening. Complex: What dress or casual options are still appropriate with denim? How can you rock a blazer with denim without looking like a tool? Kiya Babzani: In the 1980s, Calvin Klein really helped pave the way for jeans to truly become a mainstream fashion staple and since then it&apos;s been re-appropriated in every way imaginable. I&apos;m more of a purist when it comes to jeans, I&apos;m not a huge fan of seeing it done very dressed up with a blazer, but then again some might not like looking like they&apos;re straight out of a 1950s&apos; motorcycle rebel film. Complex: What denim fit do you recommend for sneakers? Kiya Babzani: A great classic straight fit jean or something slightly on the slim side is great for wearing with sneakers. It makes the outfit if the jeans are right. • CLICK HERE FOR MORE COMPLEX STYLE POSTS!